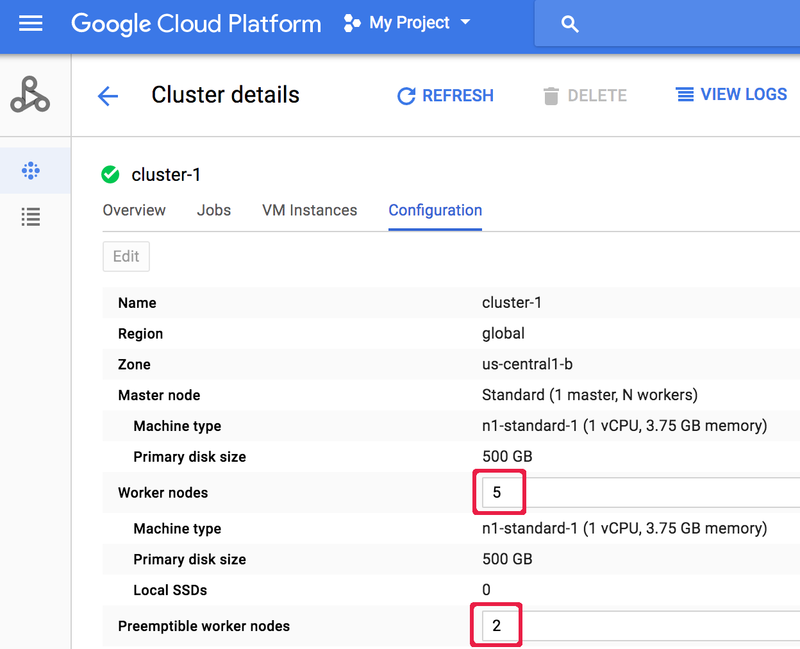 After creating a Cloud Dataproc cluster, you can adjust ("scale") the cluster by increasing or decreasing the number of primary or secondary worker nodes in the cluster. You can scale a Cloud Dataproc cluster at any time, even when jobs are running on the cluster. Use Cloud Dataproc Autoscaling. Instead of manually scaling clusters, enable Autoscaling to have Cloud Dataproc set the "right" number of workers for your workloads. Why scale a Cloud Dataproc cluster? to decrease the number of workers to save money (see Graceful Decommissioning as an option to use when downsizing a cluster to avoid losing work in progress). Because clusters can be scaled more than once, you might want to increase/decrease the cluster size at one time, and then decrease/increase the size later. Removing workers: If you remove workers from your cluster, make sure that the new cluster size is sufficient to handle your workload; if it isn't, your jobs may take a long time to complete or hang. Use the gcloud command-line tool in the Google Cloud SDK. Edit the cluster configuration in the Google Cloud Platform Console. New workers added to a cluster will use the same machine type as existing workers. For example, if a cluster is created with workers that use the n1-standard-8 machine type, new workers will also use the n1-standard-8 machine type. Note: Cloud Dataproc does not support changing worker size (vCPUs, memory, persistent disk) when you add workers to a cluster. You can scale the number of primary workers or the number of secondary (preemptible) workers, or both. For example, if you only scale the number of preemptible workers, the number of primary workers remains the same. Cloud SDK setup: You must setup and configure the Cloud SDK to use the gcloud command-line tool. To scale a cluster with gcloud dataproc clusters update, run the following command. where cluster-name is the name of the cluster to update, and new-number-of-workers is the updated number of primary and/or secondary worker nodes. For example, to scale a cluster named "dataproc-1" to use five primary worker nodes, run the following command. Waiting for cluster update operation...done. Let the Console construct your cluster update request. : You can click the Equivalent REST link at the bottom of the GCP Console Cloud Dataproc Cluster details→Configuration page to have the Console construct an equivalent API REST PATCH request. 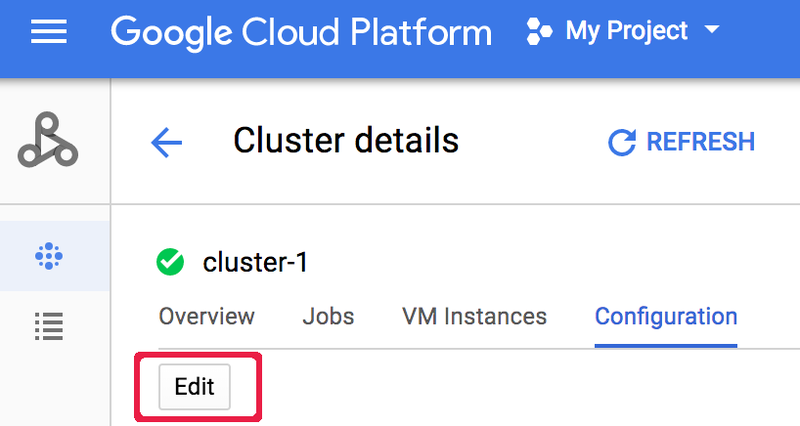 After a cluster is created, you can you can scale a cluster by opening the Cluster details page for the cluster from the GCP Console Clusters page, then clicking the Edit button on the Configuration tab. Enter a new value for the number of Worker nodes and/or Preemptible worker nodes (updated to "5" and " 2", respectively, in the following screenshot). Click Save to update the cluster. When you downscale a cluster, work in progress may terminate before completion. If you are using Cloud Dataproc v 1.2 or later, you can use Graceful Decommissioning, which incorporates graceful YARN decommissioning to finish work in progress on a worker before it is removed from the Cloud Dataproc cluster. Note: A worker is not removed from a cluster until running YARN applications are finished. wait a few minutes then repeat the graceful decommissioning request. You can forcefully decommission preemptible workers at any time. Cloud Dataproc Graceful Decommissioning incorporates graceful YARN decommissioning to finish work in progress on a worker before it is removed from the Cloud Dataproc cluster. As a default, graceful decommissioning is disabled. You enable it by setting a timeout value when you update your cluster to remove one or more workers from the cluster. When you update a cluster to remove one or more workers, use the gcloud dataproc clusters update command with the --graceful-decommission-timeout flag. The timeout (string) values can be a value of "0s" (the default; forceful not graceful decommissioning) or a positive duration relative to the current time (for example, "3s"). The maximum duration is 1 day. Durations: Specify a graceful decommissioning duration as a non-negative integer with one of the following lower-case suffixes: "s", "m", "h", or "d" for seconds, minutes, hours, or days, respectively. The maximum duration for graceful decommissioning is "1d" (one day). If the suffix is omitted, seconds is assumed. See clusters.patch.gracefulDecommissionTimeout. The timeout (string) values can be a value of "0" (the default; forceful not graceful decommissioning) or a duration in seconds (for example, "3s"). The maximum duration is 1 day. 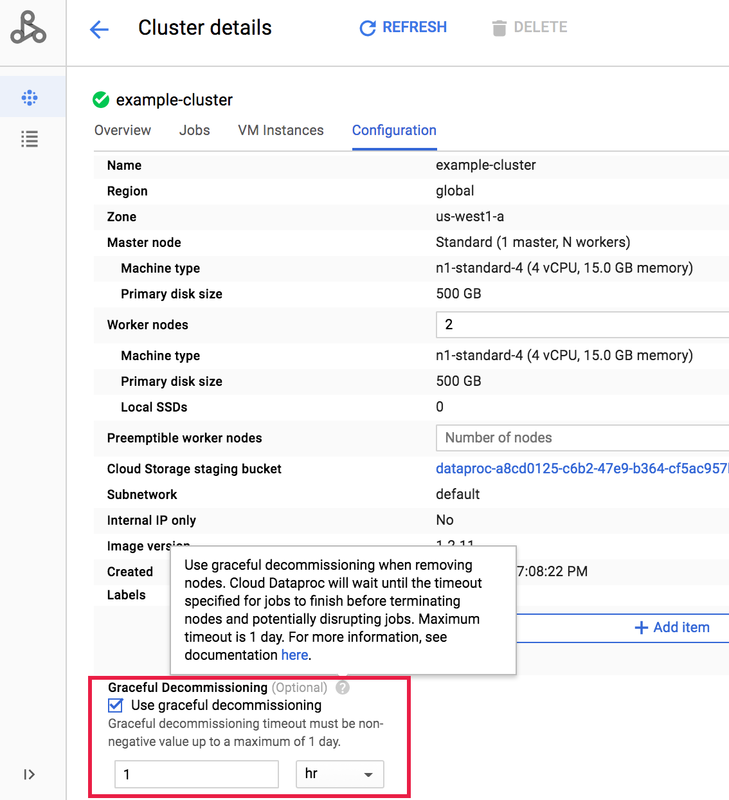 After a cluster is created, you can select graceful decommissioning of a cluster by opening the Cluster details page for the cluster from the GCP Console Clusters page, then clicking the Edit button on the Configuration tab. In the Graceful Decommissioning section, check the "Use graceful decommissioning" box, then select a timeout value.